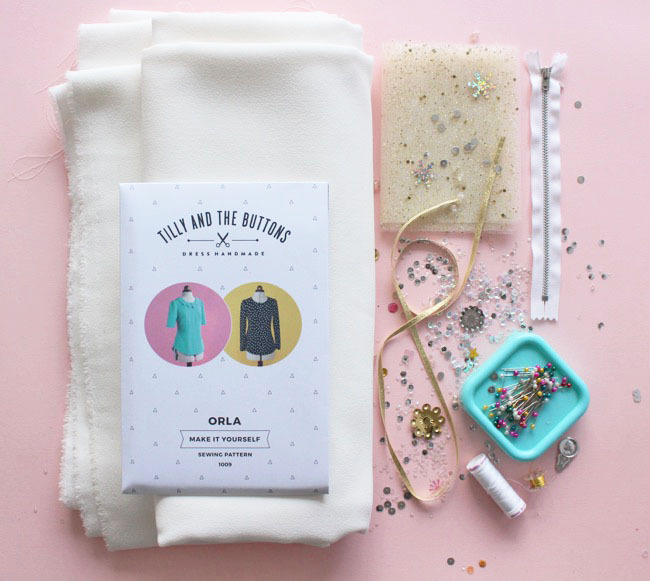 Tilly and the Buttons: Orla Dress Pattern Hack! 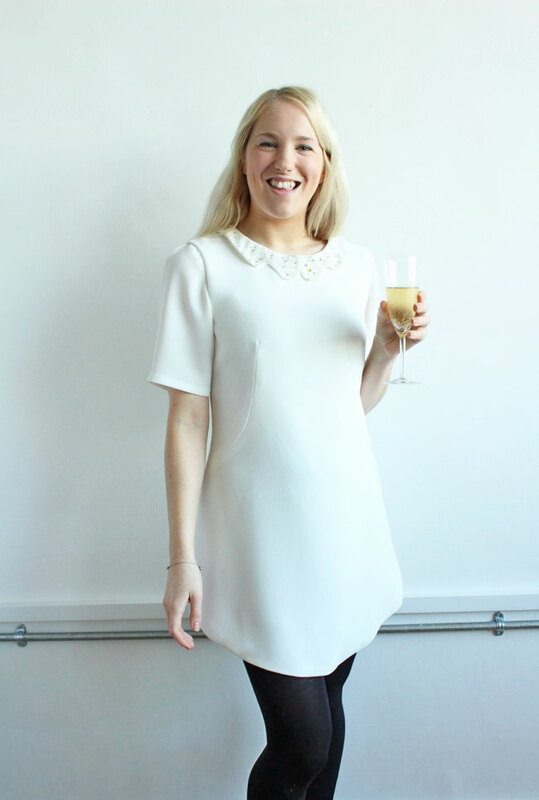 Vanessa here today - I'm going to show you a simple pattern hack for how to lengthen the Orla top sewing pattern to turn it into a beautiful, easy-to-wear shift dress - complete with the curved, dipped hem that's a feature of the original top. 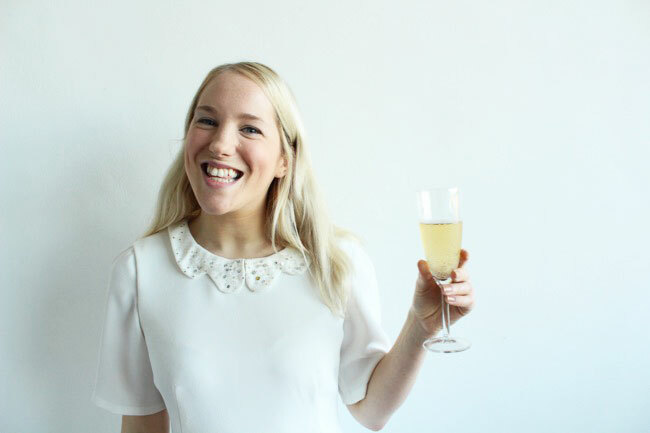 Dress her up for a Christmas party with a sparkly collar, pair with your prettiest dancing shoes – and feel the winter blues melt away! I’ve used a beautiful triple crepe fabric in cream, courtesy of our lovely sponsor, Minerva Crafts. I added some festive sparkle by stitching a layer of glittery tulle netting to the collar. 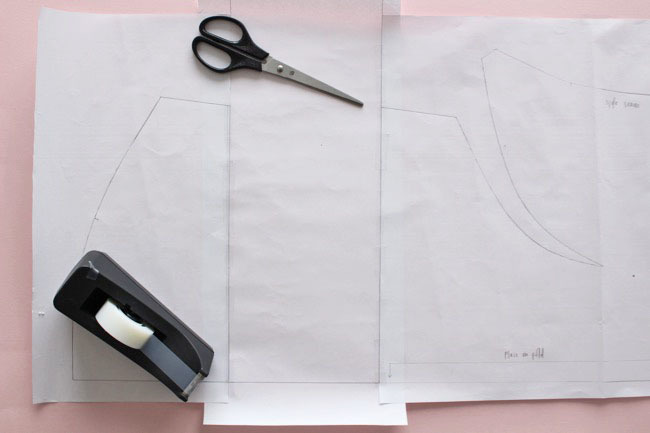 Start by tracing off a fresh copy of the front and back bodice pattern pieces, and the front and back hem facings. Remember to add the labels and notches so you know what's what later. To work out how long you want your dress to be, I find it helps to measure a dress you already own and like. Pop on a wardrobe favourite and carefully put a pin in at the waistline (where you bend to the side). 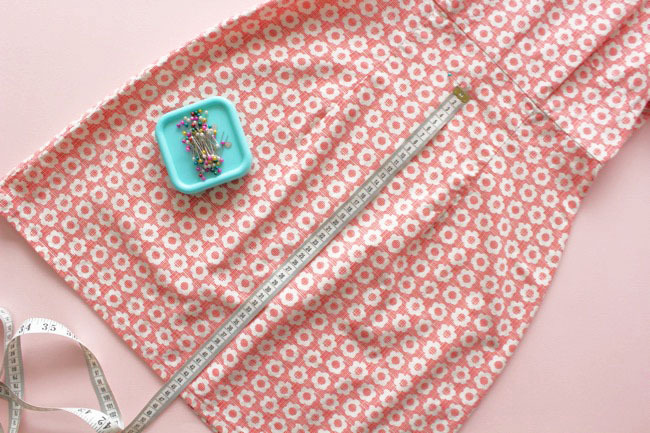 Measure from this pin to the hemline to get the waist to hem length. 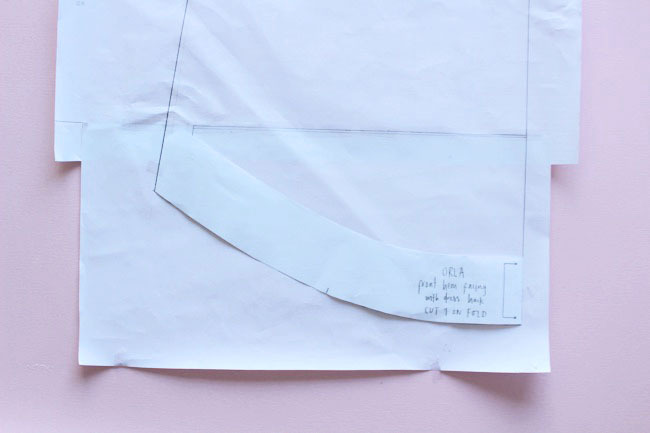 On the front and back bodice pattern pieces, draw a line at a right angle from the ‘Place on fold’ line to meet the waist notch (marked on the pattern). Measure from this point on the ‘Place on fold’ line down to 15mm (5/8in) above the hem cutting line. 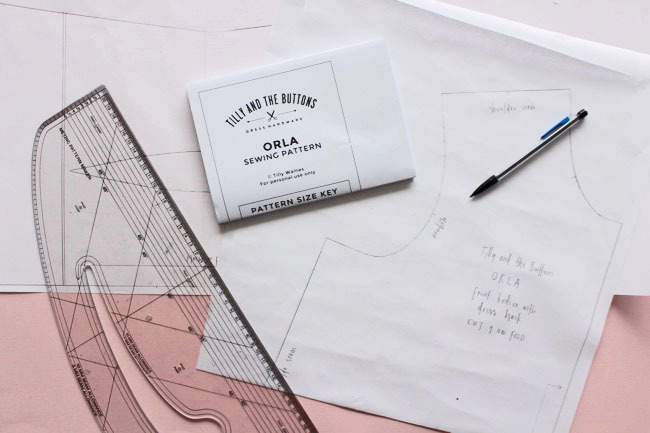 Work out the difference this length and the length of the waist-to-hem on the dress you measured in the previous step – this is the amount you will be lengthening your Orla top by. 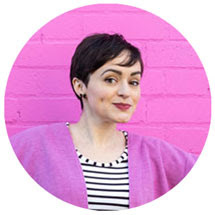 Bear in mind that the hem on the Orla top is curved, so will be slightly shorter at the side seams – you may want to make it slightly longer to accommodate for this. 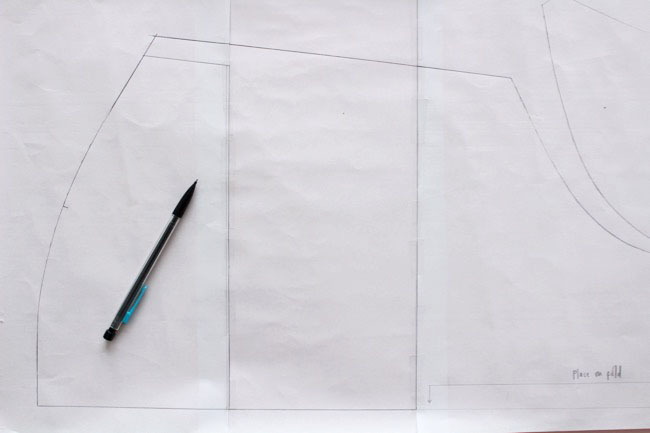 Next, on two new pieces of paper, draw two sets of horizontal lines – one for the front bodice and one for the back. The distance between the two horizontal lines is the amount you worked out in the step above. Draw a vertical line at a right angle to these to lines on the right hand side. Cut along either of the "lengthen or shorten here" lines marked on the pattern. Insert the paper from the previous step, aligning the cut edges of the pattern with the horizontal lines, and the "Place on fold" line with the vertical line. Glue or tape down. Repeat for the back bodice. 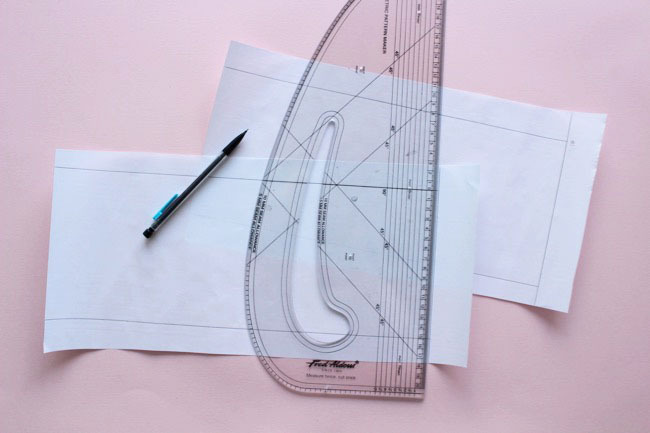 Using a ruler, extend the side seam in a straight line, at the same angle as the original line, from the bottom of the dart until it reaches the new hem level. As you can see, the side seam at the bottom is slightly wider than the side seam on the bottom of the original pattern - this is to give you a bit more room at the new hip level, which is higher up. Connect the new side seam up to the curved hem. Repeat for the other bodice piece. Because the hem is now wider than on the original pattern, we need to make the hem facings a bit wider too. 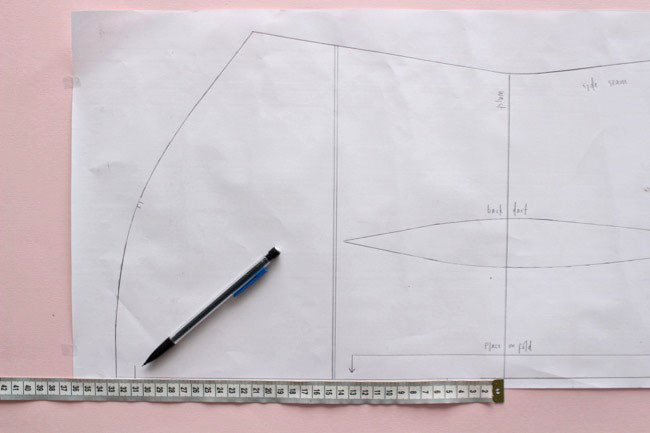 Place the front hem facing over the bottom of the front bodice, aligning the ‘Place on fold’ lines and the hem curve. Add a bit more paper to the side and trace off the extended hem curve. Repeat for the back hem facing. That's your pattern pieces done. 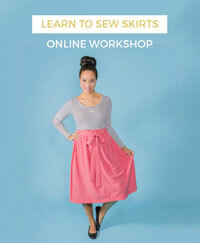 Now you can sew up the dress, following the instructions in the pattern. 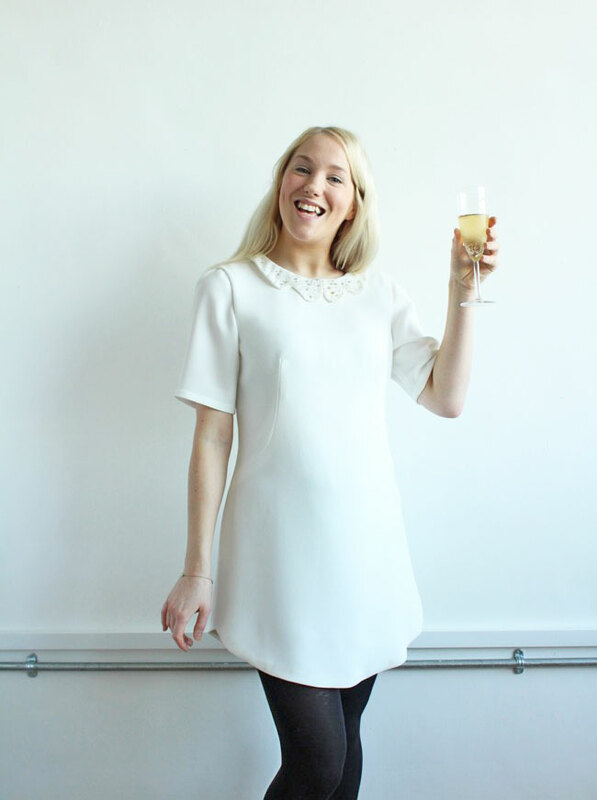 We can’t wait to see what you lovely ladies do with the Orla pattern – take her out for some festive cocktails or perhaps a spin around the dance floor... and send us some snaps when you do. Cheers!